There were a total of 245 crimes reported for this period. 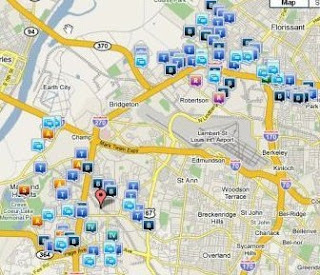 For accurate or specific details or more detailed information please visit CrimeReports.com . Master Key Systems America LLC, a family owned company are providing residents and businesses of the greater St Louis region with premium products and services aimed at minimizing potential losses and reducing criminal activity. The current economy is having noticeable affects on crime rates across America. The St Louis region has, in recent years, led the nation in crimes reported. To minimize the impact to your family and business or property, contact us NOW to understand how you can protect yourself, your colleagues, your businesses and your families with state of the art products and services. Master Key Systems America LLC - St Louis Locksmiths - 'Securing St Louis - One Door At A Time' . It is not enough that the country is battling the phony locksmith scams, there is another scam that is also just as deceiving that is scamming thousands of Americans. Copy cat locksmiths are basically individuals who have decided that instead of spending years building a business of their own, they will copy an established local locksmith who has built a successful business and earned the trust of the public. One copy cat situation that is going on is happening in Coral Springs, Florida. Richard's Locksmith and Safe company has been in business for more than 39 years. Owner Jack Rothberg noticed a few years ago that someone was advertising a name very similar to his and advertising an address that was only one block away from the real Richard's lock shop. The copy cat address is actually a Chinese restaurant and has nothing to do with the copy cat. Jack thought that all he would have to do is notify the authorities and this problem would go away. To Jack's surprise, there was not much that would be done about this crime and because he reported the crime, he was retaliated against by the copy cat. The copy cat came by Jack's shop and shot out his van windows, cut his gas lines and put and bullet through Jack's shop window. Being the security professional that Jack is, he caught the entire crime on video. The copy cat was arrested but so far has never spent a day in jail. If you would like to see the video of this crime, you can click on the link below and watch a local NBC story that aired in south Florida. We can honestly say that this copy cat case is the worst we have ever seen here at Legal Locksmiths.com. These copy cat's are popping up all around the country and the public needs to be aware of what is happening. If you feel that you have been a victim of a copy cat locksmith, whether you are a consumer or a locksmith, we would like to hear form you. Please click here and fill out our complaint form. The above article appears in the Legal Locksmiths Website. Legal Locksmiths.com has been established and is operated by Larry Friberg who is a former Phoenix police detective who has over 28 years of law enforcement experience, and many years of experience working in the locksmith and access control industry. There are many legal locksmiths that are fed up with the illegal locksmiths who are operating in the US and they too have helped create this website. There are thousands of locksmiths that are law-abiding professional business owners who have been operating legally for many years. Unfortunately, there are now thousands of phoney locksmiths who are ripping off the general public everyday and giving all locksmiths a bad name. There have been tens of thousands of victims over the last few years, and even though federal and local law enforcement agencies are cracking down on some of these criminals, you still need to be aware of what is happening. We want you to know that there are legal locksmiths waiting to assist you. That is what LegalLocksmiths.com is all about. This new development in access control solutions by EMX, allows for control of automatic doors, gates or other access controlled entry ways. The simple solution here allows up to 10 bluetooth equipped mobile phones to be registered as "keys", enabling secure access to controlled areas. Just dont lose your mobile phone. Blogging often involves many labor intense hours of writing and researching, especially if you are composing your own original works. I try to acknowledge the source of my reference in most if not all articles written here. This next post is actually by well respected Author and Locksmith Tom Rubenoff and the source of this article is from Hubpages. This article is primarily about surface mounted door closers, but the ideas herein can be applied to other kinds of door closers as well. Door closer adjustment is an art that requires knowledge, patience, and an ability to climb up and down a ladder several times, but with these attributes and the appropriate wrench, hex key or screwdriver, you can do it yourself. Most of the adjustments are implemented through the opening or closing of hydraulic valves. When it comes to turning the screws that operate these valves, a little goes a long way. A turn of 5 degrees can significantly increase or decrease closing speed. CAUTION: DO NOT COMPLETELY UNSCREW DOOR CLOSER HYDRAULIC ADJUSTMENT SCREWS OR YOU WILL RUIN THE CLOSER AND VOID THE WARRANTEE. Also, hydraulic fluid will leak out of the closer and make a mess. This will make you unpopular. A door closer is a mechanical device designed to close a door slowly, but firmly enough to latch. It accomplishes this by using spring tension modulated by hydraulic fluid. As the user opens the door, hydraulic fluid passes from one reservoir to another, and as the spring pushes the door closed again, the hydraulic fluid passes back to the previous reservoir through a series of valves that control the speed. The illustration at right shows the effects of the common hydraulic adjustment controls available on most commercial grade door closers. 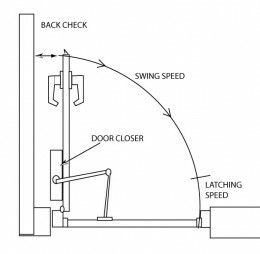 Controls for swing speed and latching speed control how fast the door closes, and many closers also feature a hydraulic control for back check that controls the last few inches of the opening the door so as to prevent the door from being slammed into an adjacent wall. The illustration below shows the various hydraulic control valves. These might be located in many configurations, but you will usually see the back check control located somewhat away from the latch speed and swing speed controls. There are also door closers equipped with an additonal valve for Delayed Action. Delayed action closers hold the door open for a longer period of time to allow persons with disabilities more time to get through the door. Also notice the Spring Tension Adjustment in the illustration above. Spring tension controls the "size" of a closer. The term is misleading, because it does not actually have anything to do with the physical dimensions of the closer. Size is determined by the width of a door. "Sized" closers, that is, closers that have a factory pre-determined spring tension for a particular door width, have no spring tension adjustment. Many door closers today are "non-sized", indicating that spring tension can be field adjusted to fit the size of the door. It is tempting to use the spring tension adjustment to solve problems, for example, in positive pressure situations where air flow is preventing the door from closing properly. However, the tighter you make the spring, the harder it will be to open the door. It is possible to tighten the spring tension to the point that some people will not be able to open the door. To adjust the door closer, bring a step ladder tall enough so that you can easily reach the door closer from the second or third highest step. Climb the ladder and examine the closer. If you can't see adjustment screws, chances are the closer has a cover. Usually the cover is plastic, but it could also be metal. If you see no fasteners holding the cover on, that means the cover is held on by tension. Pull it off. If you do see fasteners, usually you can loosen, but not remove, the fasteners and the cover will slide off. If you find that there is oil in the cover or oil on or leaking from the closer body, you can stop right now. You need a new door closer. If, however, it is not leaking, you can proceed. Now that you have the cover off, you should be able to see the adjustment screws. If you are lucky, they will be marked on the closer body as to what they are or there will be a diagram inside the cover. If not, you may have to experiment a little to see which is which. Remember, when it comes to turning door closer adjustment screws, a little goes a long way. Start with no more than 1/8 of a turn. Turn the adjustment screw clockwise to slow the door closer down, counter-clockwise to speed it up. then get down off the ladder and observe the effect. Open the door and watch it close. If it closes right the first time, check it 10 more times. If it closes correctly every time, you're done. If not, go back up the ladder and make another adjustment, etc., until the closer is doing what you want it to do. When it closes the way you want it to 10 times in a row, it will probably continue to do so. Ideally a non-delayed action door closer will close and latch the door in 7 to 8 seconds. If you expect a door closer to consistantly close the door, as a prerequisite the door must close properly. If there is a hinge problem, a warped door, or the door must swing uphill to close, a door closer will only go so far in solving the problem. Sometimes a door must be repaired before it will close and lock automatically with a door closer. In vestibule conditions, where you have an exterior door, a small space, and then an interior door, the trapped air between the inside and outside door can be a factor. You may have to adjust both closers to get both to work correctly. Wherever air pressure is a factor, including negative or positive pressure situations, I have have gotten door closers to close and latch the door consistantly by adjusting them to a slow swing speed and a somewhat fast latch speed. The slow swing speed seems to give the air a chance to get out of the way and the fast latch speed gives it a very slight slam at the end to make sure it latches. If oil is leaking from your door closer, throw it away and buy a new one. If your door closer is slamming the door and cannot be adjusted to do otherwise, either the fluid has leaked out or the valve seals are worn out. Either way, your best option is to replace it. If the closer stops closing the door before it's closed all the way, or actually spings back when you try to manually shut the door, the arm is probably installed on the shaft incorrectly. Download the instructions from the door closer manufacturer's web site and see if it is installed correctly. If the door closer has no spring tension and the spring tension adustment turns round and round with no effect, the spring is broken the door closer must be replaced. Came across a test of a copycat of the Strikemaster II product as videoed by an independent dealer. They set up their own conditions and proved the effectiveness of their duplicated version of this clearly superior product. The product displayed here is NOT Strikemaster II but quite possibly an infringe of the patent. Nonetheless, it still reinforces the reason why products of this kind greatly enhance the physical protection characteristics of door jambs and frames. I have personally installed numerous Strikemaster II units, many of them to door jambs that looked almost identical to the one destroyed here. One of the great things about Strikemaster II, is that installation on your home after a similar break in, can effectively reduce your repair/replace bill by multiple hundreds of dollars. To accurately compare the difference in costs, call a local builder/contractor and inquire as to the cost to install a completely new door and frame. The benefit that Strikemaster II provides, that this copycat product does not, is the 5 feet of laminated protection, making it substsantially harder to penetrate. A new door and frame will not withstand a kick-in attack like the Strikemaster II will, so take that into consideration when you look to purchase your new door.